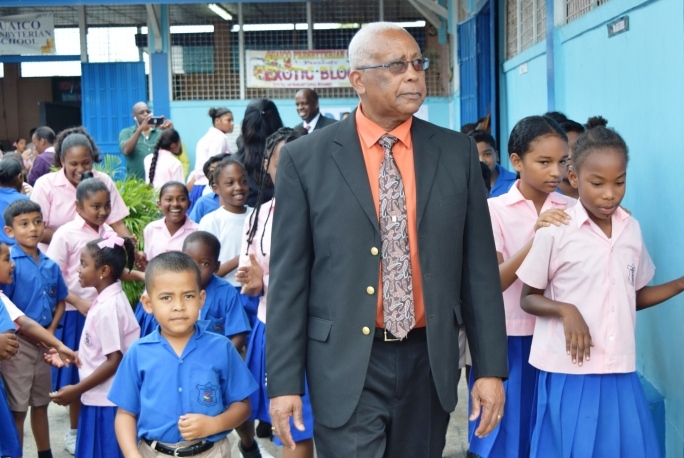 Three schools in east Trinidad have been praised by the Education Minister for having a high level of student discipline, and for their academic achievements. Minister Anthony Garcia and a team from the Education Ministry met with the Principals and staff members at the Sangre Grande Government Secondary and Guaico Presbyterian Primary, as well as Holy Cross College. They discussed school improvement plans, regularity and punctuality, disciple, School Based Management, curriculum delivery and strategies being implemented to improve literacy and numeracy. Mr. Garcia said he was very impressed with the commitment of the teachers and the way the schools are being managed. He praised the teachers at Guaico Presbyterian Primary School for maintaining high academic standards and also for being crowned National Schools Junior Panorama Champions 2019. The high level of discipline exhibited by students at Sangre Grande Government Secondary School was also highlighted. While at Holy Cross College, the team was briefed about the construction of a new ‘Six Form Science Block’ and the offering of more business related subjects.